It looks like Rockstar gets the 2013 award for “most realistic voice actors”–the developer has used actual gang members to give voice to the gangs in Grand Theft Auto V.
GTA V producer Lazlow Jones has revealed that in an attempt to provide more authenticity to the game’s ambient characters, Rockstar hired real gang members to voice them, including one who got out of prison the day before recording. There’s black gangs, there’s Latino gangs, and we recruited a guy who gets gang members, like actual gang members, real gang members. I mean, El Salvadorian gang dudes with amazing tattoos and one of which literally had gotten out of prison the day before. And we brought these guys in to record the gang characters because you know, you don’t want a goofy LA actor who went to a fancy school trying to be a hard gang member. There’s nothing worse than that. Jones also said that the gang members helped give some authenticity to some of the ambient dialogue. If the ex-convict would glance at his lines and insist that a gang member wouldn’t say that, he would be invited to deliver lines he would be more likely to say in a real-world context. Is this bid for authenticity crazy, or genius? Tell us what you think in the comments or visit us on Facebook and Twitter! Interested in winning a copy of Grand Theft Auto V? 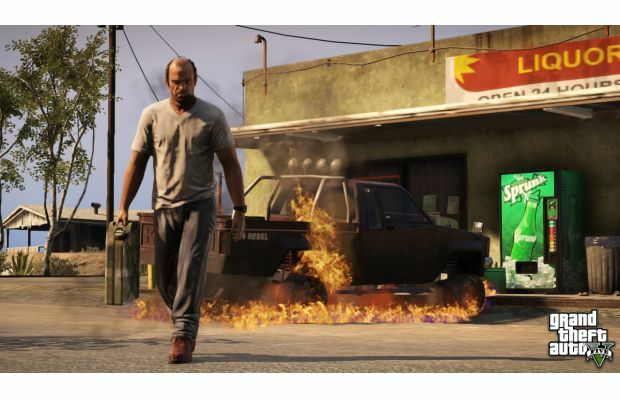 Our friends at MusicMagpie are offering a chance to win a copy of GTA V!